The project REFIMEVE+ (Réseau Fibré Métrologique à Vocation Européenne +) was funded through the Excellent Equipment call (Equipex) of the Investments for the Future program. It aims at the dissemination of an ultrastable optical frequency reference on the French area. 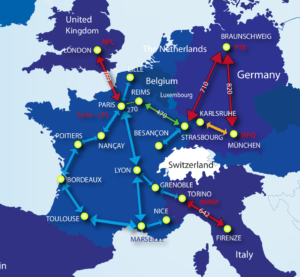 Laboratoire de Physique des Lasers (LPL) and SYRTE are leading this project, in collaboration with the French Research and Education Network RENATER (Réseau national pour la technologie, l’enseignement et la recherche) which provides the fiber network. Around twenty labs are collaborating to Refimeve+ as future user of the transferred ultrastable signal. This project concerns several scientific fields : time and frequency metrology, fundamental physics, precision spectroscopy of atoms and molecules, geophysics… This national network will also contribute to the establishment of an european metrological network. The distributed signal will be generated by SYRTE. It consists of the signal of a continuous-wave laser emitting at 1542 nm, which will be stabilised on an ultrastable cavity and controlled with the primary standards of SYRTE. This ultrastable signal is propagating in the same fibers than digital data from the internet traffic, on the national academic network, by using dense wavelength division multiplexing. The thermal and acoustical fluctuations of the fiber optical length could degrade the transmitted phase and impact the stability and accuracy of the transferred signal. These phase fluctuations are thus corrected using repeater laser stations, which are set up every 200 or 300 km on the fiber network and enables also to selectively amplify the ultrastable signal. These stations were developed at LPL and SYRTE and enable us to demonstrate an optical link with noise compensation on around 1500 km between Paris and Strasbourg and back. The relative frequency unstabilities added by the fiber propagation come down to a few 10-18 after a few hours of measurement. The industrial development of the repeater laser stations and the bidirectional amplifiers, which will equip the future national network, is currently performed by three french companies, Muquans, Syrlinks et Keopsys. Amplifiers were already successfully achieved, and first prototypes of the stations were also realized. The building of the network, its optimization and its management, is currently being studied and will be achieved end of 2018.